NEW… Introducing online contact lens ordering from the comfort of home…..
After finding a contact lens that fits properly, is comfortable for you, and provides good vision, your Kelowna eye doctor will then be able to write a contact lens prescription for you. This prescription will designate the contact lens power, the curvature of the lens (called the base curve), the lens diameter, and the lens name and manufacturer. 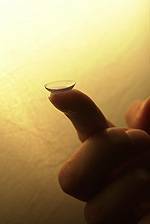 In the case of GP contact lenses, additional specifications may also be included.